Hello my FAITH-ful readers! I hope you’ve had a great week! Our pack has some incredibly ‘woof-derful’ news that will make you jump for joy! We have a new addition to our pack- John & MERCER are now part of the maCares Service Dog Support Program! MERCER, who followed in the paw prints of his mother’s and father’s service dog careers, happily shared how he met John. 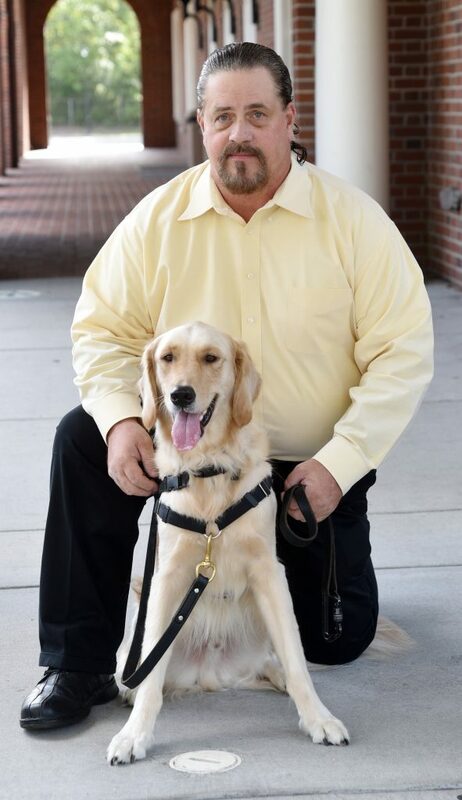 After years of John isolating himself and not being able to live a full life, John applied for a service dog to assist him with his Post Traumatic Stress and other tasks. John served in the Navy for 23 years, since his 17th birthday. During his 3 tours, he was involved in many different areas of conflict. Upon discharge, John was diagnosed with leg and nerve issues and PTS. In 2015 MERCER sniffed John and formed a deep bond, ready and wanting to help him. MERCER has tremendously improved the quality of life for John. MERCER assists John when he is experiencing nerve issues or symptoms from his heart condition. MERCER reduces John’s anxiety, stress, anger, and depression. He has awakened John during nightmares and flashbacks, calming him. MERCER alerts John to people approaching from behind and when his anxiety levels increase, MERCER helps John regain control. All of MERCER’s help gives John the confidence and assistance to interact with others, lessening his feelings of being out of place and his loneliness. MERCER has given John added motivation to get out and enjoy a new life – for him, his family, and his friends. With MERCER’s help, John volunteers teaching ESL (English As A Second Language), which is something John says he would have never been able to do before. John and MERCER also like to give back by volunteering at the homeless shelter to feed the hungry. John enjoys church activities and singing in the choir, fishing, walking trails, and sporting events. MERCER is named after Mercer University in Macon, Georgia because he was born during the NCAA Tournament and they were part of the Sweet 16 his litter was named after. The pack and our 2-legged friends are so excited that John & MERCER have joined the maCares family! Please help us celebrate and support them! Be sure to check out all the maCares & faith Cares service dog teams at www.maCares.org. Stay up-to-date on the events maCares holds to raise money to stay committed to ‘Helping Service Dogs Help Others’ by following us on Facebook. Together we are helping to make a difference in the lives of others. You can also help us support service dog teams and rescued animals in need by making a tax deductible donation or purchasing from our Facebook Shop. Check back soon for updates from yours truly!